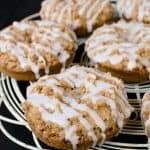 Do you need a delicious coffee cake to share with your mom on Mother’s Day? 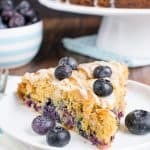 This Blueberry Cream Coffee Cake has four layers of goodness that goes so well with a cup of coffee. Our children might be becoming breakfast snobs over here. Apparently I have been making too many things with chocolate for breakfast because this cake got the evil eye from a few of them. They kept asking where the chocolate cinnamon rolls were? I think that just means more cake for me. And when that cake is a coffee cake, it becomes fair game for breakfast time. There is something so comforting about a slice of coffee cake and a big steamy mug of coffee in the morning. Since I enjoyed this coffee cake so much, I am going to request it again for Mother’s Day. And by request it, I really mean make it again for myself to indulge on while my family does yard work for me. Do you have any fun plans to celebrate with your mother? We usually spend the day going to church, eating lunch, and then buying new plants for the flowerbeds. After we get in as many new plants as we can, we end the day with a campfire. Maybe we will even make another pan of these toasted marshmallow cheesecake brownies to enjoy by the fire. This coffee cake has all sorts of good stuff going on inside it. There is the bottom layer of cake which has this buttery crumb texture that just melts in your mouth. 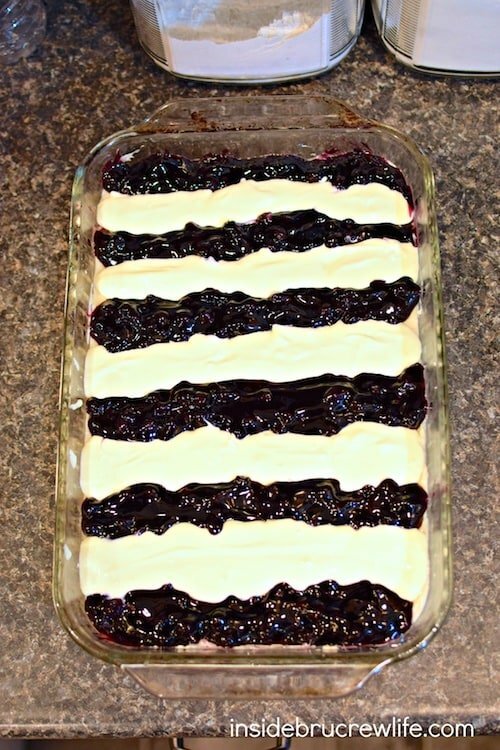 Then on top of that I alternated lines of cheesecake and blueberry pie filling, but you can swirl it together if you like. To take the cake one step farther, you are going to cover the top of everything with a crumble topping. And because this cake doesn’t have enough sugar going on in it, a simple glaze drizzled on top finishes it off and makes it so pretty! This is perfect for enjoying on any random weekend for sure, but I highly suggest making a pan of this for your mother. She definitely would enjoy a giant slice with her coffee while you do some chores for her. I am one of the breakfast contributors for Food Fanatic. 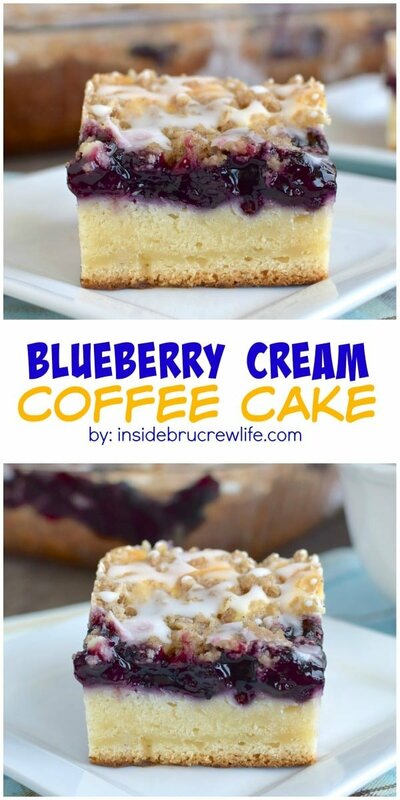 Head over there to print this Blueberry Cream Coffee Cake recipe for later. What a gorgeous coffee cake, Jocelyn! I’ve never seen one with four layers before, love this! I think my mom would be thrilled with a pretty treat like this. Pinned! Thank you Gayle! It was fun to layer so much goodness in this cake!!! 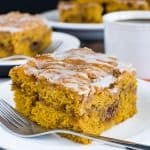 I love that coffee cake is an acceptable breakfast item. This looks amazing! 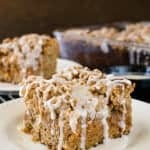 I can’t tell you how glad I am that coffee cake can be breakfast too! Mad props for that! This is my kind of breakfast. I am a huge blueberry fan and cake for breakfast- even better. Tell me about it…cake for breakfast is all kinds of yum! 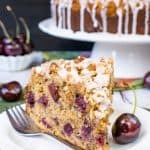 This coffee cake is like dessert for breakfast! Love it! Yes!!!! Dessert made acceptable for breakfast! Got to love that! I am a chocoholic myself – but darn – I don’t think I could pass on these! These sound so decadent – and make me wanna climb through my screen! I’m with you there on the chocolate love, but believe me these blueberry bars were pretty dang good! I’m with your kids. Chocolate cinnamon rolls for breakfast every day! Though this is a close second. I’m digging ALL four layers! Love every single one of these delightful layers!! I understand wanting chocolate for breakfast or lunch or dinner or a snack or just because, but this cake is a game changer! This cake looks amazing! I love how moist and dense it looks, YUM!!! I have a huge weakness for coffee cake and I love all of the layers in this one! 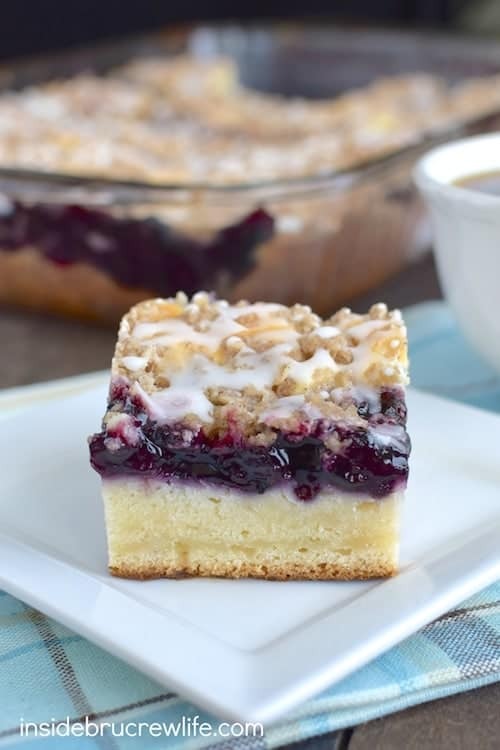 Hi….can this be made w/raspberry pie filling instead of blueberry pie filling? I have the raspberry pie filling on hand. Please reply. Thanks. This looks amazing! What a beautiful creation, thanks and Happy Mother’s Day to all Moms out there! This coffee cake is pretty much perfection! 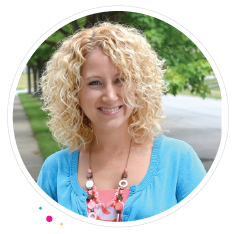 Being in charge of dessert and coffee sounds like such a fun job and a great way to serve. That’s awesome that you did that! And wine tasting with your mom and grandpa sounds like a fun way to spend the day together!!! Cinnamon Rolls? I don’t think I’d miss the cinnamon rolls if someone served me up a piece of this delicious cake! Oh, this looks amazingly delicious! 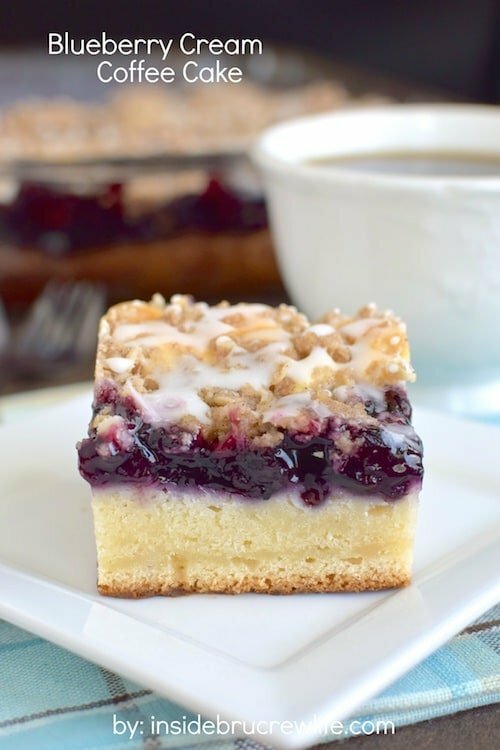 We love blueberries and coffee cake, so combining the two just makes sense. 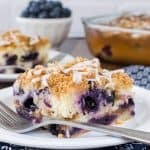 Can you use fresh blueberries instead for this recipe? Would alterations need to be made? Thanks, looks yummy. Hi, Toni. I’m not really sure since the only way I made this was with blueberry pie filling. You could use fresh blueberries to make a homemade pie filling to use. 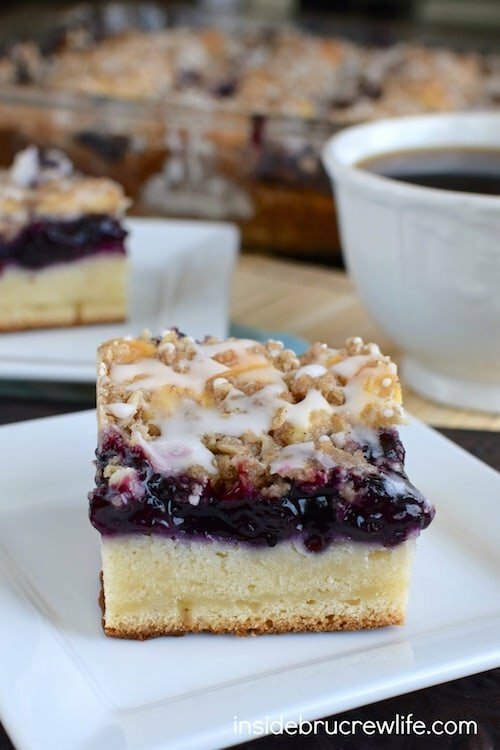 This Blueberry Cream Coffee Cake looks and, I am quite sure, tastes positively delicious. It is easy to tell that just by looking at the pictures in the recipe. 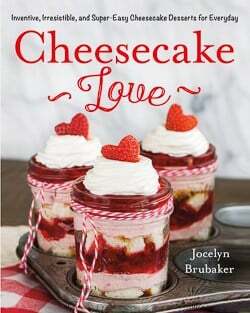 Thank you for this recipe for a wonderful treat for Mom and Dad as well. EXACTLY what oatmeal did you use? I used whatever oats I had in my cupboard at the time. You can use rolled or quick! Making this right now for “mom coffee Tuesdays” at a friend’s house!!! Looks amazing. Was simple to whip together. Made no changes or substitutes… We shall see!! !